It wasn’t until 1985 that TAG Heuer actually become TAG Heuer. That was the year Mansour Ojjeh’s TAG Group rescued the original Heuer company from the decade-long Quartz Watch Crisis that began in the late 1970s. Fans of timepieces made in Switzerland will know that the Swiss mechanical watch industry had taken a severe nosedive during that period, almost entirely due to the massive spread of cheap Japanese quartz watches. At the time, Mansour Ojjeh also happened to own a significant stake in McLaren. Plus, the TAG Group (TAG stands for ‘Techniques d’Avant Garde’) was heavily involved in the financing of the Porsche-built engines for McLaren F1 cars. Which all seemed to fit nicely with the important role Heuer played in the world of precision sports, a role the company had enjoyed more or less since its founding way back in 1860. It was Edouard Heuer who, in the tiny Swiss village of St-Imier, propelled his innovative designs along a determined path which would lead rapidly to success. Edouard invoked his expertise and entrepreneurial spirit into breaking new ground in the Swiss watchmaking industry. In 1887 his creation, the ‘oscillating piston,’ contributed enormously to advances in the chronograph industry, even now remains in production at TAG Heuer and other major manufacturers. Heuer patented the first ever ‘dashboard chronograph’ in 1911. The innovative ‘Time of Trip’ technology was fitted in automobiles and aeroplanes and allowed its users to monitor and measure the duration of their trips. Then, in 1916, Heuer highlighted their success with another accomplishment. The ‘Micrograph’, was the first stopwatch accurate to 1/100th of a second. The timepiece well and truly established the company’s contribution to the sporting world, and to this day, TAG Heuer has been the official timekeeper of professional athletes and major sporting events all around the world. Between 1992 and 2003, TAG Heuer served as official timekeeper for Formula 1. The close cooperation is represented in the now famous watch line, TAG Heuer Formula 1, a collection that speaks to lovers of both premium watches and exhilarating motorsports. TAG Heuer went on to design three innovative collections for McLaren Mercedes, most recently represented by Formula 1 driver Jenson Button. Tag Heuer has steadily expanded its exciting watch collections, creating innovative technologies while maintaining the iconic watch designs of the past. In 2004, the company presented the Monaco V4, a watch inspired by the legendary and timeless 1964 Monaco worn by Steve McQueen. The timepiece is the first in the world with a belt-driven transmission. In 2005, TAG Heuer once again took the watchmaking world by storm This time it was with the Calibre 360, the first mechanical chronograph with a measured accuracy of 1/100th of a second. The masterpiece cements the connection between the company and automobile racing even further and is 10x faster than any other mechanical watch movement existing today. The precision which professional sports demand continues to be the inspiration that drives TAG Heuer. And while the company can look back on a rich history of tradition and innovation, it continues to push even newer advances in watchmaking technology and never fails to impress its devoted fan and customer base worldwide. TAG Heuer watches are available from high street jewellers, but the best bargains can be had in the used market. 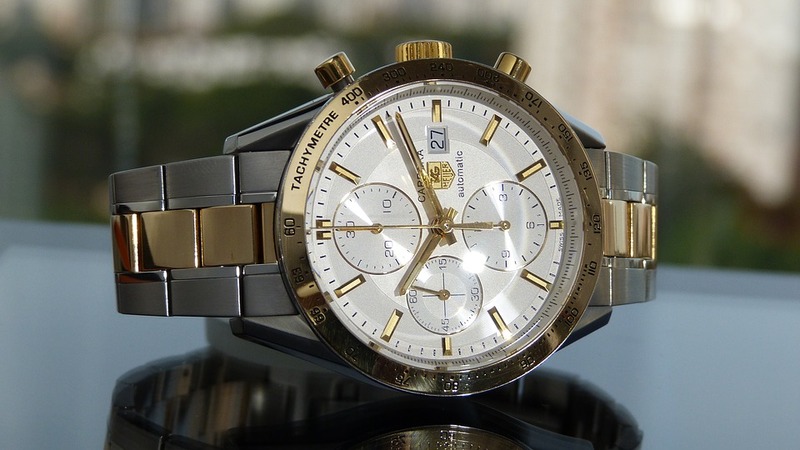 Shop for TAG Heuer at eBay or Amazon.